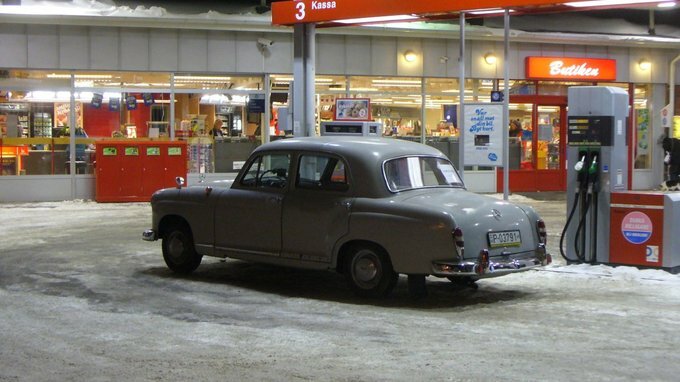 We made the transcontinental trip to Sweden all right, we could even start the engine and take the car for a short run, so I bought it. Was I to know about the problems lurking ahead of us, I’d have decided otherwise. Standing beside the broken hulk of the Mercedes I had bought earlier that day, my thoughts weren't exactly revolving around the childhood dreams I paired with the car. Not a bit. Trying to scrape my thoughts together in the freezing cold of the Harnosänd night at one A.M., I was dumbfounded. Not a word could escape my mouth. The huge lorry that had just crashed into us a moment earlier was looming just a few metres behind, with its engine idling. My wife was still in shock, freezing in the passenger seat. And a passer-by had already called the police. To make things worse, we still had 2500 kilometres to go and technical problems were mounting. And now the car was a wreck. How on earth did I end up in this huge mess? I had some time until the police arrived, so I started putting the puzzle together. 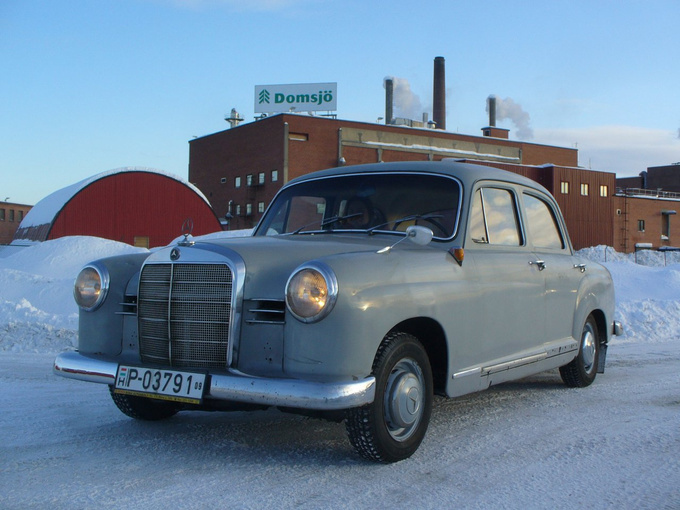 You could follow me up to the point when I bought this Mercedes-Benz 180c made in 1962 from a small city called Domsjö in Sweden. 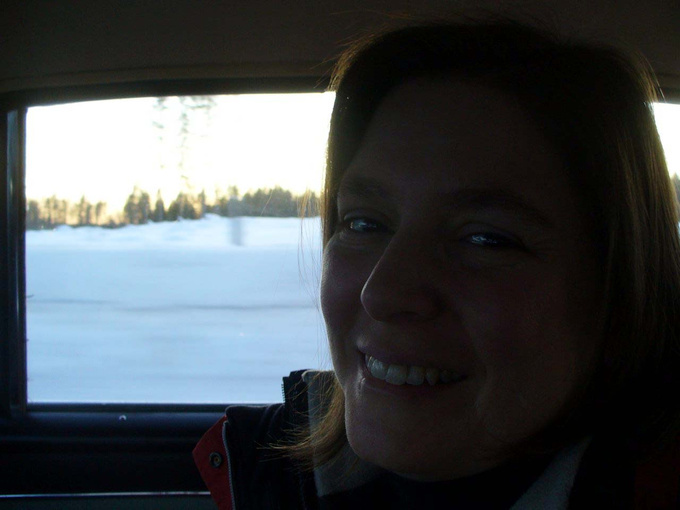 The time was March 1st which was still very much wintertime there, in a spitting distance from the Arctic circle. The car tried to hijack the deal by refusing to start, but my mechanic friend, the ingenious Karesz solved the problem. 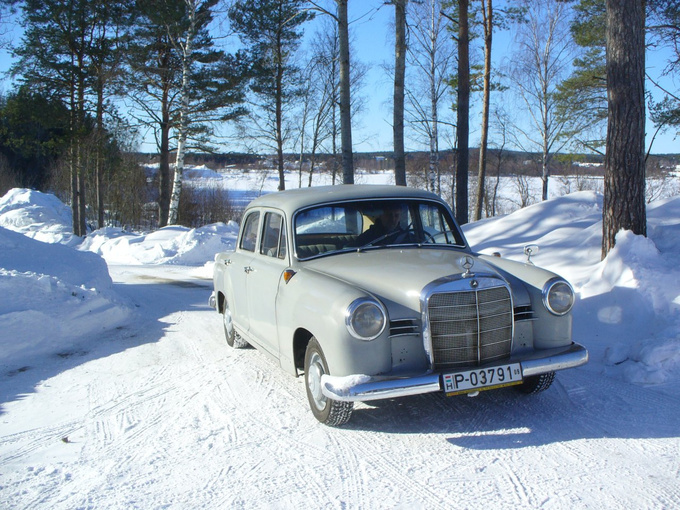 I also got to know that the elderly vendor had bought the Mercedes half a year earlier from a city on the other side of Sweden, called Karlstad because he knew that in the regions of Sweden near the border of Norway they were not using any salt on the roads in the winter. He trailered the car home, but made up his mind, and decided to sell it on. After finding out that the old Mercedes had had winter tyres on it all along (why, oh why did we have to carry the set from my wife's car all across Europe, when I asked this three times in my letters?) I paid for it, we signed the papers, had a hearty lunch together in the vendor's home and agreed to having a visit at his classic car club's warehouse at the outskirts of the city. Now, with two cars at hand we finally had enough space. Some of the stuff made it into the “new” Merc, thus the seats of the Insignia were freed at last. Karesz, the mechanic, Sipos, who brought his trade plates to take the car home with and played a role as a 24-hour helper and Tibby, my boss, who scraped the money together for the trip and was driver no. ,1 could all have a stretch in the seats. We jumped into the Merc with my wife and set out on the first drive with it. Of course, I noticed the flickering red light on the instrument panel. You'd have noticed it too. But I thought that the ghoulish starting procedure had been enough of bad luck for that day, so with all my efforts I tried not to care about it. 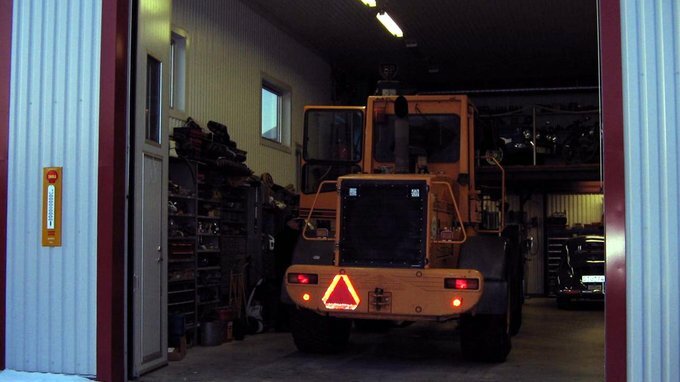 But, as you know, you have to have your headlights on in the daytime in Sweden, even in cities, so after all the struggle with the starting and then having power-sapping electric consumers working, my battery went flat in no time. You know how it is. In such manly moments you start bringing up professional explanations – this car has got a dynamo instead of an alternator, which doesn't charge the battery when the engine is idling, so it would just have needed some more revs...– you know the rest. We pulled over in a very snowy and desolate car park, Karesz got out the multimeter, we managed to start the engine, I revved it...and all our professional guesses went up in smoke. The bloody dynamo wasn't charging at all. You see, this was the reason why we didn't spend the next three hours with the guided tour of the club's amassed classic vehicles –we repaired the electric system instead. Okay, let's call it bodging. 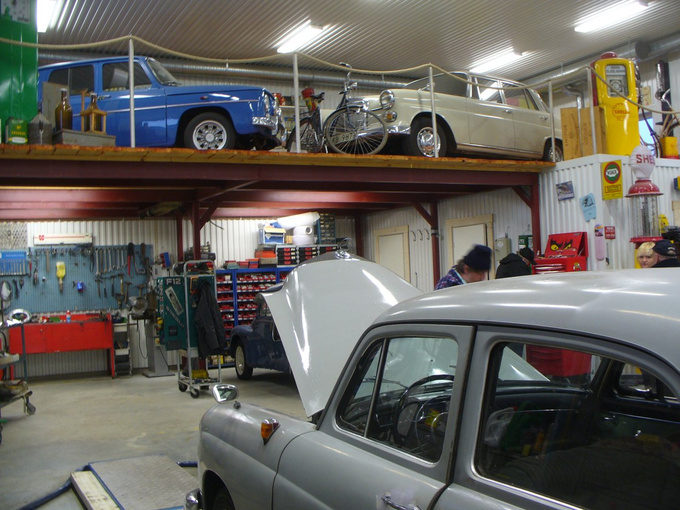 We could have freely rummaged through the wonderful old Swedish car magazines on the shelves, but we rather rummaged through the small drawers of connectors and screws. Karesz got out the dynamo, gave it some power from the battery and it started spinning. Well, this proved it to be okay, so there was just another point in the charging system that could have gone wrong – the regulator. We kindly received one (much later type of regulator with a black-cover) from a freshly restored Fintail Merc residing on the elevated café floor of the club's hangar, put the system together with that one and – alas! – it worked. After three hours and a minor heart attack we were ready to go again. The local classic mag's reporter had a five-minute interview with us, then we bade farewell and hit the road. I still remember the incredibly startled expression on the faces of all of the vendor's friends – have these guys gone mad to drive off into the Swedish winter night with a hump of junk like that? 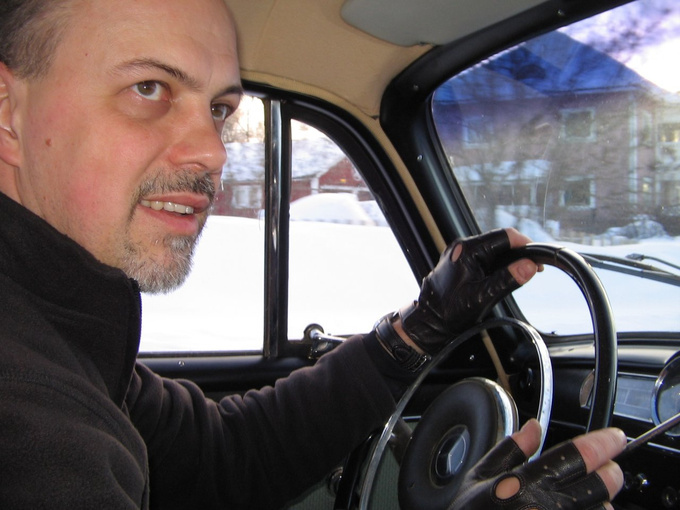 The Swedish night is a very friendly place on March the 1st, especially if you like temperatures where birds freeze solid in the air while flying, even more if you love cars that do not have an operating heating system. My my wife is not one of your kind. She discovered that to sit on her side of the Ponton, it is a bit of a chilly experience. After about a hundred kilometres the situation got much worse. See, Pontons already had a stereo heating systems from 1953 and in fact, the one on my side was working somewhat. But the one on Kati's was just supplying gobs of fresh icy air, unstoppably. After having been wrapped up in blankets and two layers of jackets she started feeling a bit better, especially when she stuck her feet across to my side to get them warm in the wind exiting on my side of the footwell. Now there's another discovery – sometimes it's better not to have a middle console under the dash, thus you can do things as we did. The car was as homely as the inside of a four-star Electrolux refrigerator, but we had been expecting worse. And there were high points too. The engine that had an incredibly rough idle went on a sweet song at 90 kph, the suspension proved to be much better than any other car's designed in the early 50's that I had driven before, the brakes were okay and even the lights were throwing some light on the tarmac. Had there been a bit more heat, the experience would have verged on the border of being quite good. Of course, just as the speedo, the illumination on the right side of the instruments wasn't working either, the seat base of the driver was sagging towards the left, the crumpled rubber in the mounts let all the vibrations of the engine across to the chassis and the exhaust had a leak for sure. But there was a good steering to be enjoyed, perfect synchro on all four speeds of the ‘box, a differential that made no sounds whatsoever, a silently spinning propeller shaft and a subdued wind noise. There was a lot to be happy about. Then disaster struck. We were just entering the city of Harnosänd. For a while then, I had some very strong lights in my mirrors (which, to my regret, I was unable to adjust properly). The single-lane road had another one blending into it from the right, making it a two-lane street. I put on the indicator to move out of the way, but the steering of a 50-year-old car isn't as precise on the icy pavement as a modern's. Let's just say I lumbered across the lanes in nice, big waves. There must have been a bit of impatience on the side of the Finnish lorry driver too, and all this lead to physical contact. In a moment we felt a huge jerk from behind in the Merc, accompanied by a colossal bang. 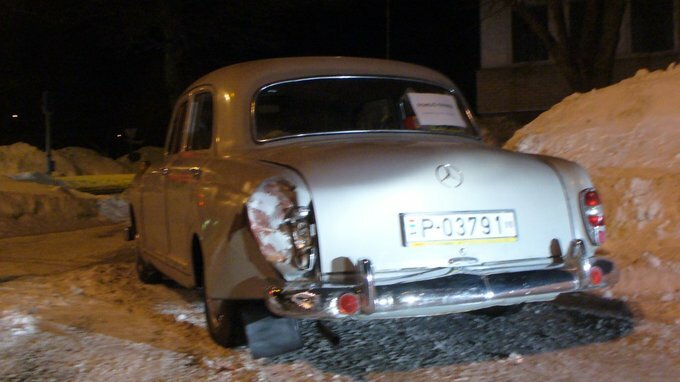 In a fraction of a second we had the ruins of a 50-year-old classic on the banking of a Swedish city's main road at one A.M. in the -17 degrees Celsius. 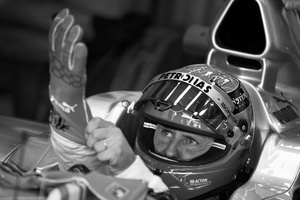 The body of the Mercedes was broken at the left rear end. We also had an unreliable charging. The heating system was giving up the fight. Oh, and there were some police, who arrived to interrogate the case. I can recall some happier moments in my life. 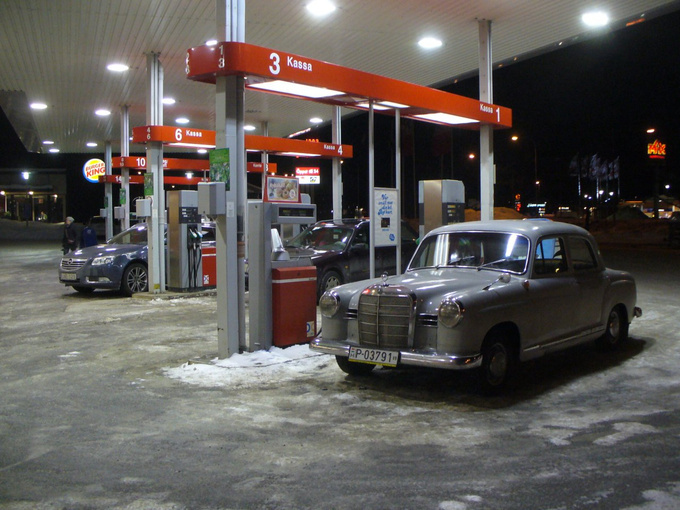 But after all, the Merc was still running, all four doors and even the trunk could be easily opened and closed – remember, the famous safety engineer, Béla Barényi already had a hand in the design of the Ponton. The police were also really nice, they noted down that it was the lorry driver's fault. We decided not to give up. Next morning we bought some standard trailer light lenses at a petrol station, used the best part of a Duct Tape roll to fasten them on the body and we carried on. Peaceful moments arrived next day. First we tried a speed of 100, then 110 kph with the Ponton (according to the GPS, wow) on the motorway and it didn't seem to bother. What a great car, this one is! By the time we got to Stockholm, I started seeing things in a different light. If we could carry on like this, we might really be able to make it to Hungary. And if the car's structure hasn't distorted too much, it will still be possible to put it right within my financial limits. High hopes, nice hopes, but we still had another 1600 kms to the finish.